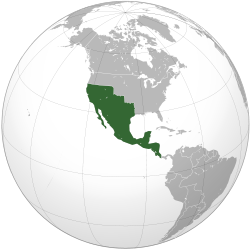 The Mexican Empire (Spanish: Imperio Mexicano) was the official name of independent Mexico. It was a monarchy from 1821 to 1823. The territory of the Mexican Empire included New Spain and the former Captaincy General of Guatemala. Mexico then declared itself a republic. However, it reverted to a monarchy during the Second Mexican Empire of Maximilian I of Mexico. This page was last changed on 13 July 2018, at 01:43.